If the Bionic Man had sinus problems, he’d have gotten nowhere. Which makes me rant, why can’t we in modern times do something better than sinuses? Do we really need them? (I know we do, so don’t flame me.) But yeesh, I’m sick of them. Mine are better than they were before the surgery, but I still have chronic problems. I’m tired of the whole thing. So, I don’t want us to take away from cancer research or anything, but I’ll be the first one to call into the telethon that has found a way to replace sinuses with a better system! Walking wounded, help the others…. I had to take Morgan back to the hospital yesterday. She collapsed in the morning and couldn’t walk. It was like she had a stroke; it was really frightening. They said she has a vestibulary problem in her nervous system, especially in the nerves in the brain. It throws off her balance which is why she couldn’t keep on her feet; the vertigo is horrible. She could have had a version that happens with old dogs: it happens suddenly but heals itself in a week. But the risk was, she could have a brain tumor. Thankfully, she came out of it on her own, which leans towards her being fine. Thank goodness! Pumpkin Seed Oil! Here to save the planet! Casey has been having accidents; when the vet ruled out health issues, it came down to getting older and a weaker bladder. 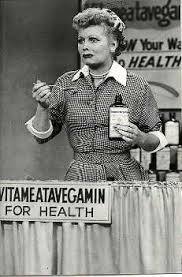 People with vet degrees in my animal shelter group recommended pumpkin seed oil. I told my friend Preston about this and he looked up what it does. I should say, what DOESN’T it do? The mighty Pumpkin Seed Oil helps regulate cholesterol levels! Prevents hardening of the arteries! Fights tapeworms! Treats depression! Eliminates parasites from the intestines! And who doesn’t hate those little boogers! By the way, since one of the major things it does is help with incontinence, when I called the the health food store to see if they had it, the person on the other end looked it up in the computer, and suddenly did the classic, “Ma’am, can I ask? Are you looking for this because of <drop voice to whisper> bladder control?” Which is actually very nice. You wouldn’t want them announcing to the entire store, “You got pee problems, Miss?” Anyway, I answered calmly that yes, that’s why I was calling, and then defensively, “It’s for my dog!” You know they were thinking, yeah right! This tangent brought to you by A.D.D! Yes, A.D.D. – offering a life time of diversions in every minute! And now back to the regular post. Wife: And just look at that shine! Preston started joking: It’s so tasty too! Tastes just like candy! So when you’re looking for a way to bring about World Peace, remember the orange heroine! I finally had enough and went to the doctor’s last night. Making the appointment ended up being perfect timing because on top of the congestion and coughing, my sinuses crashed on the way home, making me dizzy and extremely tired. I had to put the window down so I didn’t fall asleep. 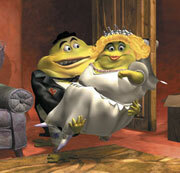 Apparently I have that guy from the Mucinex commercials moved into my chest along with his family and friends. Also apparently, they’re not practicing protection and escalated everything to an infection. And I was even taking Mucinex this whole time! I suspect some kind of duplicity here: I take Mucinex…. Blobby and his friends almost go away, but come back in force so I take more Mucinex, sales skyrocket. Yes, skyrocket! I’ve been fighting this thing since December 17th! But I am not known for my ninja skills for nothing! (Now I have Conjunction Junction running through my head. No wonder my ears are stuffed up. )…. anyway, since congestion is not enough to make the wait worth it, my body decided to shove a rib out of place in my back. From the coughing. Yippee. It’s nothing major; it’s just a bit of alignment and doesn’t bother a lot. Mostly it’s when I cough…. but I’m armed with PRESCRIPTION drugs now! Blobby’s days are numbered. Me: Here I go, out into the cold! He immediately called out: Wear a coat! I have a regular doctor’s appointment tonight, and I’m hoping to find out about the blood infection that the Red Cross found and why I might be so tired all the time. I’d bet money that he’ll say I have to get more blood work done even though I had it in February. If they find out what’s going on and can actually give me answers, then it’s worth it. But I’m frustrated already because I feel like it’ll be another get-no-answers and let’s-try-this-drug and see what happens in 3 weeks. What a waste it’s been so far!